Sharing some thoughts on the ‘new’ social science textbooks recently released in Karnataka, the debates on which are hardly substantive and key questions continue to escape our attention. Once we go through this news report which laments the quality of the revised textbooks, (Click here) it only goes to show how notions of quality are linked to very simplistic and shallow external attributes in popular educational discourses. For if the textbooks were not bad enough, so are the criticisms against them much of it being puerile. Spelling mistakes, missing pages seem to be the biggest drawback highlighted and more dismal is the criticism of absence of few names of persons and places, both Kannada and national. And while a big deal is being made of some ‘factual’ errors, the more important issue of nature of knowledge and models of historical inquiry that are so problematic in these textbooks remain unquestioned. Information masquerades as knowledge and both the textbook makers and its alleged critics are actually celebrating an acontextual mode of cognition and knowledge and are no more than shadow-boxing here. Further teachers are seen to be irrelevant as important mediators of textbook knowledge. Tragically, if the teachers quoted in the story are anything to go by (also commonly observed in my own experience), teachers themselves are absolving and undermining their own worth and ability where pedagogy is limited to a view and practice of mere transfer of information from textbooks to students. Hence the possibility of teachers bringing in their own understanding and correcting lapses in textbooks hardly seem important. In any case, right from the beginning nothing substantial was expected from the social science textbooks. For the worthy committee formed in Karnataka to re-look into the state textbooks had earlier itself asserted that the state textbooks were already on par with Ncert, a claim which can barely stand scrutiny. The supposedly new textbooks ergo is the same old wine in the same old bottle and only a bit more tasteless pulp added in terms of information which rather than stimulating either teachers or students will only dull them further. The other main worry is how come a matter to be solely decided by a curricular and pedagogic body like DSERTs' or SCERTs' (which in most -though not all- cases have failed to produce textbooks of curricular and pedagogic quality and worth similar to what Eklavya or NCERT have done. 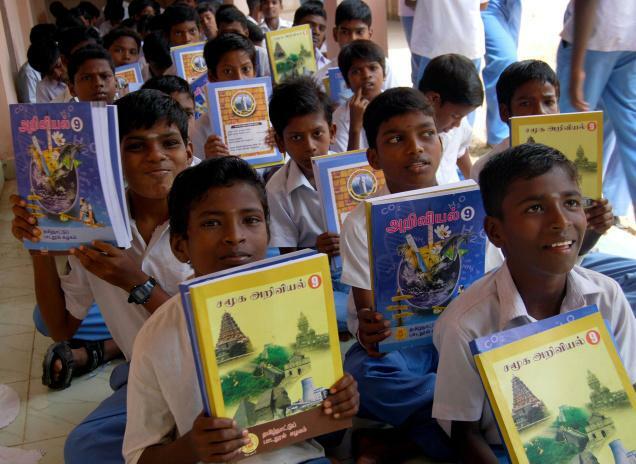 Exceptions can also include Kerala and Telengana textbooks which have much to commend for itself here.) make way for chauvinistic linguists and its representative bodies who by default will have the tendency to assert an un-negotiated, uniform and homogenous linguistic and cultural identity and smudge polychromatic variations obtained in regional cultures into a dull monochrome. The main function of social sciences is to critique and debate a priori cultural and social assumptions and not its reinforcement via assertions and monologic spiels. Much of the regional Scerts (like in Tamil nadu, Karnataka, Maharashtra...being stated here as examples) are so much captive to chauvinistic ideologies which merely create a meta-narrative which is justified in terms of a counter to the meta-narrative of North-Hindi centric pan Indian nationalism that often saturates the national. public sphere. Language (or religion or even ethnicity) does not by default create a community particularly into a political one and it has to be engineered and imagined so. This necessity maybe be practical and historical but this process has to be historicized, debated and understood. Disinterring language and history in a systematic, scholarly way could and should be done in a way that can bind people in new modes in consonance with modernity where reason, logic, debate, dialogue and indeed democracy are its defining attributes. This understanding is vital for democracy and exactly where social sciences in schools help in socializing students into new dispositions and where newer collectives are nurtured. But if the knowledge peddled and the process itself is so flawed, what augurs for Karnataka and indeed India? For example the introductory chapter in class VI SS book on why history, justifies so by suggesting history reinforces societal memory and hence useful and necessary. But unless the textbook problemmatizes memory and establishes it as an arena where memories are shown to be selective, community specific (caste, regions, gender) and therefore a very contested terrain the textbook will be merely regurgitating dominant and allegedly collective memories of the past. And thats precisely what these textbooks do. On the other hand we should invite the young and the old in a process to examine such homogenizing memories, its validity and worth and disnter these discourses which are essentially one of power. Study of history indeed is the very act of critiquing such 'commonsensical' memories of the past. The worry is such disembodied views of sociological and historical knowledge engineered in regional socio-cultural spaces would also be replicated (as the previous NDA govt already did in its previous term and there are enough indications that it may be repeated again) at the national level. The use of such theoretically flawed modes of inquiry (if one can even call it an inquiry) where a staid, acontextual knowledge is merely transferred by loud assertions and recourse to political authority. In this regard particularly in social sciences, textbooks are the ultimate weapons. This becomes an example of banking education which Friere warned us against. Here let me add more by stating that whatever be the ideology that education carries, knowledge cannot be reduced to being didactic and rhetorical. In the process of knowledge creation and dissemination, the inferences and conclusions you arrive at and derive cannot be short circuited by ignoring the process of deductive or inductive reasoning. Pedagogy entails precisely these processes. Mere conclusions cannot be capsulized and thrown and asserted at people as knowledge to be assimilated and memorized. Indeed such disembodied process can be counter-productive to even those attempts by the so called Hindutva forces where they are seen to propagate a homogenized Hindu centric ideology. Indeed it can well be argued that it’s precisely because the latter ideology (or any ideology based on language or religious chauvinism) cannot be sustained by a systematic attempt of reasoning that certain a priori assumptions are sought to be thrust rather pedantically. However it may also be argued that certain kind of culture specific knowledge beyond the canons of reason thru the categories of heritage and spirit can also be adequately theorized and rendered into a pedagogy. But probably the jury is still out on this. Coming specifically back to Kannada and Karnataka history, given the literary dynamism in its literature and the deeply interrogative quality exemplified by writers from the times of Kuvempu to Bhyrappa, Kannada has that inherent resilience to tackle questioning, debate and dialogue. Kannada identity is more inclusive and needs to be made more so by studied debate and public dialogue but where recourse to very particularistic and chauvinistic identities hardly do justice to its humanistic ethos. This is akin to the argument for multiculturalism made vis-a-vis pan-Indian history which too is seen to be inherently pluralistic. Such a vision, spirit of inquiry and thought has to continue and the young generation be introduced to such a discourse in our school spaces through appropriate pedagogic and curricular interventions. Alas…as it emerges, we have a long way to go. Films- sociological historical and pedagogic possibilities.